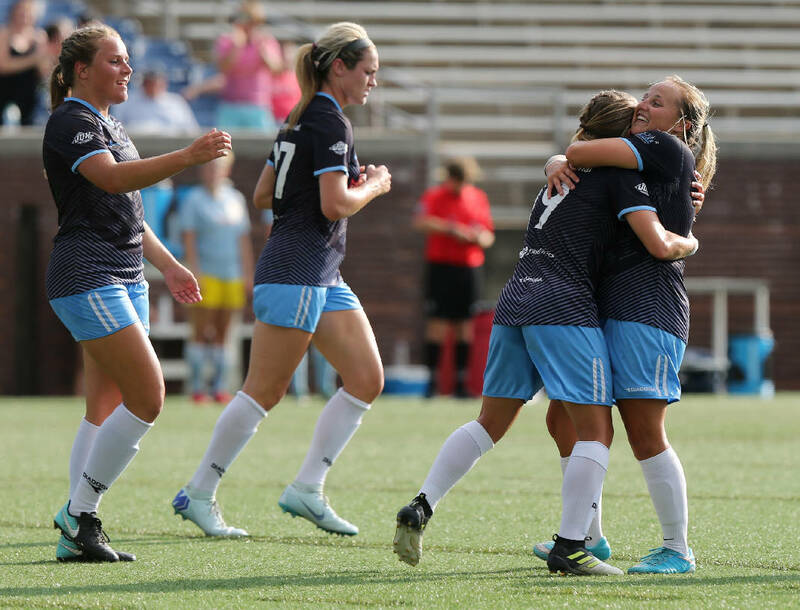 Chattanooga FC's Mia Hollingsworth, second from right, celebrates with Carlie Banks after Banks headed in a cross from Hollingsworth for the first goal of a 2-0 win against the Cincinnati Sirens FC on Sunday at Finley Stadium. Photo by Erin O. Smith /Times Free Press. On Sunday, the Chattanooga Football Club women began preparing for the playoffs and what they hope is a deep postseason run. It included a bunch of moving pieces, some different combinations — and a win. Mia Hollingsworth had a goal and an assist, while goalkeeper Danielle Krzyzaniak earned her first win of the season in the team's 2-0 victory over the Cincinnati Sirens FC at Finley Stadium. CFC (8-1) moves on to the Women's Premier Soccer League's South Region playoffs, which begin Friday at Finley. CFC is in the semifinals with the Carolina Rapids, the Florida Gulf Coast Dutch Lions and Pensacola FC. Semifinals will be played Friday and Saturday, with the championship match scheduled for Sunday. CFC was already dealing with a few of its players, including regular starters Cosette Morche' and Brooke Pirkle, having to head back to college to prepare for the season. Combine that with vacations and the end of a holiday week, and CFC got off to a slow start Sunday. The hosts got on the board in the 33rd minute when Hollingsworth's cross was headed in by Carlie Banks. Hollingsworth then scored in the 55th minute, firing a shot from the left side that slipped through the goalkeeper's hands. The regular-season finale against the Sirens (4-4) of the East Region's Ohio Valley Conference offered a good chance to tune up. "Tonight's game had no consequences, so it gave us a chance to look at different combinations of players," CFC coach Erin Ridley said. "We had several players that haven't played for us yet this season that were able to play tonight, which was great. To come in, get a performance, get a result, I thought was quite good. "We've got to get to training, get back together. We've got this this week to get everything together. This was the start of our preparation for Friday. Our standards are higher, and they weren't met for the entirety of the game, but ultimately we were able to achieve what we wanted to achieve and were able to get people in that hadn't had a chance to play." The CFC men battled to a 1-all draw on the road Sunday against the Atlanta Silverbacks to close the regular season. The match had little bearing on the National Premier Soccer League South Region's Southeast Conference race, because the teams had already clinched the top two seeds in this week's conference tournament. CFC (8-2-3) is the top seed, while Atlanta (7-4-2) — 3-0-1 in its past four matches — is No. 2. Felipe Oliveira had CFC's goal in the 77th minute after Atlanta took a 1-0 lead on a Joao Johanning goal in the 24th. CFC's next match is Thursday at Finley Stadium. Contact Gene Henley at ghenley@timesfreepress.com. Follow him on Twitter @genehenleytfp.